Do you guys have favorite flip flops? I swear I own like a million pairs and rotate them all summer. These regular black Havaianas are pretty much on my feet from the moment it gets warm until my feet are frozen. I have them in all kinds of fun colors and I always, always go back to these. 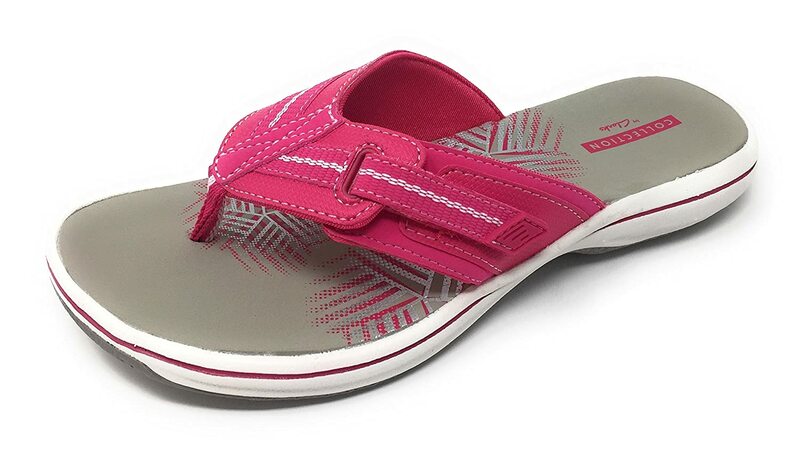 Then we have these Reef flips that I got last year as a recommendation from my sister-in-law. They are really comfortable and I have a second pair that has rose gold straps. The Hubster bought these Clarks for me for Valentine’s Day a few years ago and it was so thoughtful of him to get me pink flips. Except I kind of hate them. They aren’t comfortable on my feet. And the day I wore them out, I saw an elderly women using a walker wearing them and I decided I couldn’t wear mine anymore. These Under Armour flips I bought in Key West and they are going to be my new favorite this year for sure. I have a feeling they’ll be fighting with my Havaianas all summer! These are (new to me) sandals called Olukai Ohana flip flops. They have great reviews and I think my mother-in-law would love these for Mother’s Day! What flips are you guys wearing this summer? I’m up to try something new!